Jabiru here! This summer marks my 4th year on Kintail staff, but I also have been involved in other parts of the Presbyterian Church in Canada over the last few years. 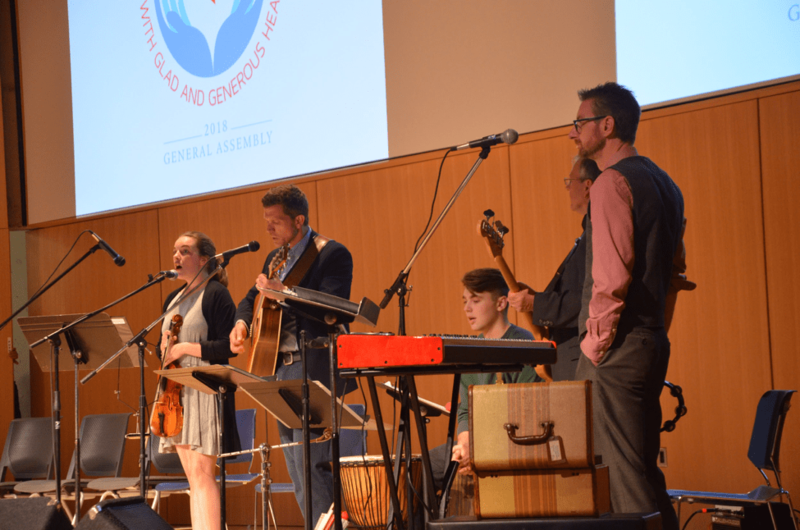 The past two summers I have also had the privilege of attending the General Assembly of the Presbyterian Church in Canada, first as a Young Adult Representative (YAR), and this year as a part of the worship team and serving with the PCC’s Rainbow Communion Committee. My experience at both General Assemblies was fantastic. As a young person in the Presbyterian Church, people are eager (and occasionally not-so-eager) to hear my view on current events such as discussions surrounding human sexuality, First Nations and PCC relations, and the representation of young people in the church. I engaged in many discussions about many different topics, and had several healthy disagreements about what the church’s way forward should be. I also witnessed some more heated discussions about what the values and plans of action of the Presbyterian church should be- many people disagreed about many different things. However, one thing about my identity was well-received every time- that I am a staff member at Kintail. Many times over the course of GA I was introduced as ‘Sydney- she’s on staff at Camp Kintail’. Every time I was welcomed this way I was greeted warmly, and ministers and elders from across the country were all quick to tell me how incredible Kintail is. I was asked many questions about how camp was growing so fast, about the status of the new building, and whether I was having a good time (to which the answer was obviously yes!). I was told over and over that the ministry which Camp Kintail provides is one of the strongest points in the PCC. Many could not stress enough how important the work of the counsellors at camp is. Though the church disagrees on many things, the one thing that everyone I came across was able to agree on was that the ministry that Kintail offers its visitors and campers honours what God has given us, and draws the circle of the church wider to welcome children and adults alike. I was told more than once that I should be proud to be a part of a community like Kintail- and I most certainly am.